If you are looking for an exotic destination that is a little out of the ordinary why not try a Cuba holiday. This Caribbean island is a beach lover's paradise with hundreds of sandy beaches and rocky coves. Not out of the ordinary, you may think. But Cuba is not all about sand and sea. It has charming cities such as Havana, Santiago de Cuba and Trinidad with differing architectural styles, where little appears to have changed over the decades. Travel Back in Time with a Trip to Cuba. The sight of fifties, gas-guzzling US cars are such a common sight that they don't raise an eyebrow. The warmth and liveliness of the people is found everywhere and, although time is certainly not of the essence, service is good. Since financial support from the former Soviet Union dried up, the government has spent vast sums on the islands infrastructure and tourist facilities, in order to encourage overseas visitors. Cheap Cuba holidays provide you with first class accommodation, good food and plenty of recreational facilities. The island itself possesses great natural beauty with mountains and hills giving way to verdant plains sugar plantations which, in turn, give way to stunning shores of the softest sand. The warm, clear waters of the Caribbean Sea have their fair share of coral reefs filled with marine life of all shapes, sizes and hues, perfect for the scuba diver and the snorkeler. Cuba is an Island for all the Family. Cheap Cuba holidays have wide appeal. They attract young families and couples of all ages, as well as groups of friends looking for idyllic beaches and lively evening entertainment. 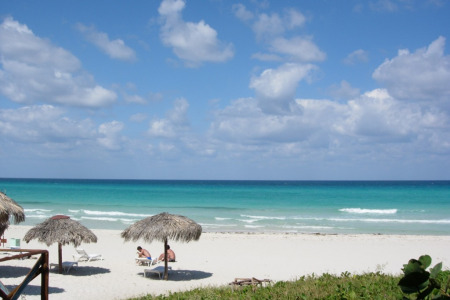 Cuba has become popular as a honeymoon destination as the allure of a deserted beach is hard to resist. Since tourism is now a major contributor to the island's economy, the industry strives to give you a superb holiday experience. Nothing is too much trouble. Their all-inclusive hotels attract families with growing children who seem to graze all day, ever thirsting for the next soft drink. Plying them with drinks and snacks can be expensive so this option offers good value. We are a price comparison site that takes the drudgery out of finding the holiday that offers the best value. With almost three dozen travel companies longing for your custom, competition is strong. And competition brings bargains. Our search facility enables you to see, at a glance, the Cuba holiday that is the cheapest. All you have to do to secure the holiday is make a phone call. To book the best deal, don't delay, call today. Want to know abit more about Cuba? This is where you’ll find handy, helpful advice and ideas that’ll save you time and money when you’re going on holiday. A Brave New World: - Cuba Opens Doors to U.S. Tourism Giants. Here Comes the Sun! : - Is It Time to Book Your Summer Holiday?